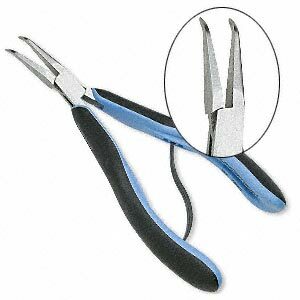 A couple of years ago, Jean Yates wrote a blog post for Art Bead Scene where she shared the reasons why she loved bent nose pliers, specifically the Lindstrom ones shown above. Check out her reasons in this post from February 2008. Looking for something fun to do in April? How about having some Bead Fest Fun?! Don't you love rubies? But, they are pretty pricey unless you opt for sparkling ruby yarn. This necklace combines ruby yarn and black filigree components. Do you struggle to add Swarovski rivolis to your bead embroidery? Cyndi has the solution for you in her brand new e-booklet, "Three Bezels Plus a Bonus"!